Count Duckula is a recurring villain and conspiring antagonist of Danger Mouse, a vegetarian vampire duck motivated to become famous, especially more so than the world renowned Danger Mouse, Duckula will stop at nothing to become the star he think's he truly is. Duckula is also prone to jealousy, as his entire grudge against Danger Mouse is simply because Danger Mouse is more world renown than him. He dislikes the idea of anybody being more famous than him or hogging the very little attention he manages to accumulate. An example of this being in his (proper) debut he got very jealous and upset when Danger Mouse was getting more attention then him during Duckula's accordion performance, even when said attention was negative attention from an enraged mob planning to throw Danger Mouse of a roof. Similarly to The Count Duckula from the original Danger Mouse he doesn't seem all that ashamed to be a vampire and has used his vampire powers to scheme and escape from Danger Mouse on several occasions, though like The Count Duckula from his own show, he's a vegetarian and as such his vampire powers all tie into vegetables, though we're never given a reason on why this Count Duckula is a vegetarian. Something this Count shares with both his predecessors though, is his strong believe in his musical and theatrical talents, as he considers the world in desperate need for his voice. While he is known to play a verity of instruments his old reliable seems to be his guitar which he carries regularly, though most people would agree he's no good and some have even called him down right talent-less, Danger Mouse even stated in "Clash of the Odd-esey" that Duckula was a lot easier to be around if he coundn't sing and then preceded to use his newly found god-like powers to teleport Duckula's beak straightoff his own face, something that seem to really sadden Duckula (after the initial shock wore off). He also seems to be untalented at writing as well as The Narrator has called his scripts garbage. That being said, his urge to present these talents to the public and to be admired are his only motive for being a criminal, and only sees crime as a means to an end. This was proven in both "Half the World Is Enough" and "The Supies" where he gave up on crime for a chance at legitimate fame and admiration. "I just want to be loved, is that really to much to ask?" What make's him stick out from the other villains (besides the fact that he's a vegetarian vampire) is that he's not motivated by money or power, like Greenback or the Crumhorn's. It was reviled in "The Duckula Show" that he just want's to be loved and admired by literally everyone in the world implying he lacks self-esteem and just wants to be verified in his own way. That being said however his ego is pretty big as he genuinely believes he should be the star of the show and has even tried to rewrite the entire show's universe to be about him, twice! Hypnotism- If you look into his eye's he can hypnotize you to do whatever he wants, on top of that the process turns you into a half vegetable zombie. High Pain Tolerance- He was attacked by a lion, eaten by a whale, and thrown into a volcano and he still wasn't out of commission, not until they dropped an ice cream truck on him, anyway. He seems to have a picture of the 17th Count Duckula framed on the wall opposite to the main entrance as a nod to the classic T.V. show staring the Count. 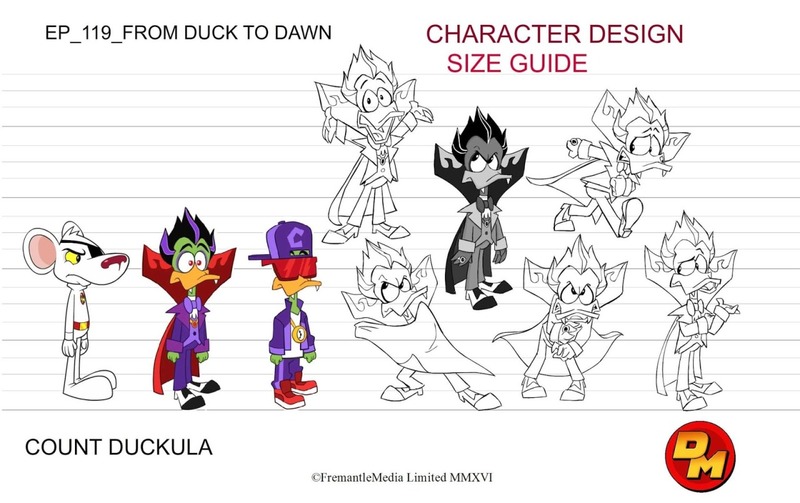 He is the first version of Count Duckula to wear shoes or even pants. A common animation error with him is that his ring vanishes from time to time. Almost every time he has appeared he's broken the fourth wall in one way or another. In fact he's the character to do it the most consistently. Despite being a vampire he has no issue with walking around in the day time. He also has been shown to be imprisoned in Arkwright Asylum for the Criminally Challenged on occasion. While the original Count Duckula and the 17th Count Duckula had a red bow tie and purple on the inside of their cape, this Count Duckula has a purple bow tie and red on the inside (and outside) of his cape. He seems accustomed to flames as they are both on his cape and guitar. He is considered one of Danger Mouse's worst enemies, though not bad as Greenback (D.M. 's most dangerous foe) or Crumhorn (D.M. 's smartest foe). Though, he was at one point the only villain in the entire show, in The Duckula Show and at that point was alternating reality, thus temporally making him Danger Mouse most powerful enemy. His entire grudge against Danger Mouse, is simply because he's more famous than him. On top of that It seems that he's perfectly aware he's in a TV show, staring Danger Mouse. He seemingly doesn't mind, and is more or less miffed that it's not his show. He seems to regularly enjoy ice cream, though the official Danger Mouse twitter suggests his favorite food is broccoli. Akin to the previous version of the Count. He's friends with Dawn Crumhorn aka The Princess on Spamchops, probably due to her helping him escape prison in Mousefall. The two also danced together for the helmet of power in 'We aren't Family', implying that there might be a friendship between the two. Despite this he claims to think Duckula to be one of the real villains in "The Snowman Comeths". He seems to be unable to teleport unlike the original Count Duckula (1981), hence the use of his Rubber Duck Mobile.